In the previous episode of her life, she was an humanitarian doctor working in developing countries and travelling a lot from place to place. After a long time not knitting, she has taken needles back in hands during her first pregnancy and didn’t stop since! She likes designing simple, easy and fun to knit garments and accessories and love exploring styles and techniques. 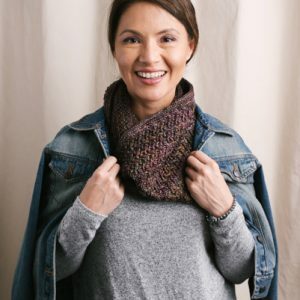 Knit in no time at all, this beautiful cowl is perfect for that time of year when leaves start falling and the wind turns colder. Show off your favorite multi-colored yarn using the gorgeous texture featured in this pattern. Planning summer holidays on the beach? You cannot miss this top! Dare to show off your bare shoulders wearing this unique and stylish piece. The elegant neckline, feminine silhouette, fringes and texture make this top a must have. Wear it during the day over a bikini at the beach or don it by itself at night during a romantic dinner! If you dream of promenades by the sea waiting for summer to come, you will love knitting and wearing your very own Captain’s Jacket! This jacket mixes up elegant lines with comfortable details to make a versatile jacket perfect for everyday use. The A-line body makes it feminine and wearable while removable hood and pockets protect you from crisp breezes as you enjoy Sunday walks along the beach. Heading to the ice rink with your friends in style with a new knit jacket. “Dancing” ribs go up on sleeves and shoulders of this elegant, cozy jacket. 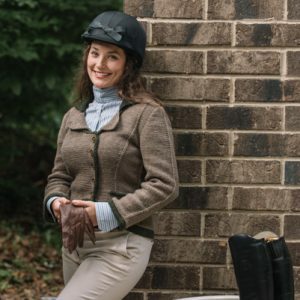 The dense texture and the unusual shoulder design make this jacket a unique piece, while the deep collar, buttons and pockets add interest and versatility.